Get Your Big Time Toys and Schylling Amazing Live Sea Monkey kit with all the trimmings including the eggs and water and food. 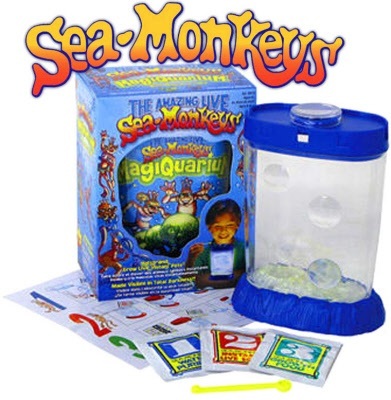 It is very simple to set up SeaMonkey kit as this comes with all the items you need to hatch the eggs withing 24 hours.The Amazing live Sea-Monkeys Kit includes all the products you will require to grow your own lovely Aqua-Pets. Big Time Toys in partnership with Schylling Toys have done it again with the Ocean Zoo. #3 A Whole Lot of Growth Food. The crystal clear styrene tank has either red or blue accents, and all contents come shrink-wrapped inside the tank. Includes life insurance policy and guarantee. Colors vary on each kit.